Let me cite some reasons why I love December. It’s my birthday on the 7th, the second leg for the year of Bloggers United usually happens on the first or second Saturday of the month, Christmas celebrations everywhere, shopping for presents, family gatherings, vacation, and so much more. Nothing beats the joyous vibe of December! As I’ve mentioned earlier, Bloggers United is drawing near, too! 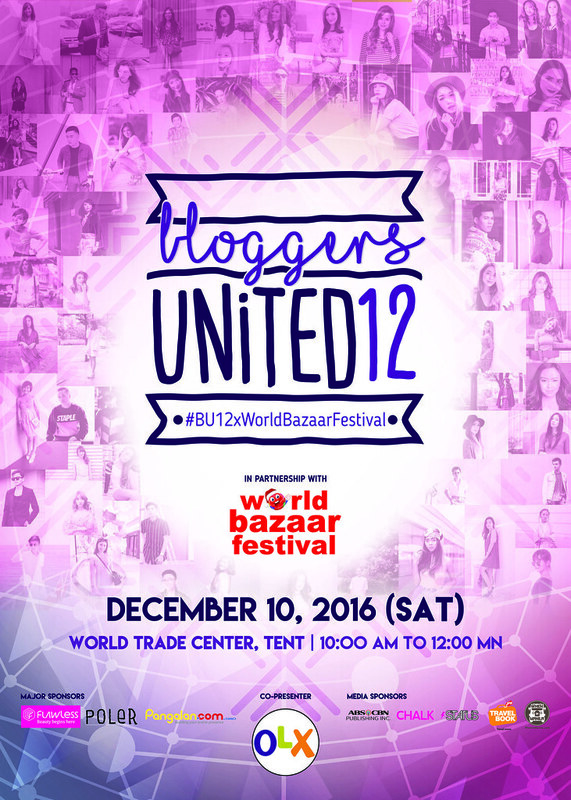 This biannual interactive shopping event is happening on December 10, 2016 at the World Trade Center. I’m so excited to see all my readers and friends there! Raid my closet (literally) once more, as I’m bringing so many clothes, shoes, accessories, and makeup for you guys! Selling those for as low as Php50.00 so please go early because my booth usually goes empty in a few hours. Wild! 1. Follow me on Instagram (@arnievillanueva_) and Twitter (@arnsvillanueva). 2. Check the BU12 Official Poster, look for me, and take a screenshot! Post it on Twitter, and tag @arnsvillanueva and @bloggers_united. 3. Mention any silly thing that you want to do with me at Bloggers United in your tweet! I’ll announce the winners on December 8! Tweet away! Coinciding with this event is our partner, World Bazaar Festival, which will give you more reasons to shop this Christmas. The biggest bazaar in the metro is slated from December 3 to 22 at the World Trade Center. You can shop from more than 1,000 booths in 20 spectacular days at the grandest and longest running charity bazaar for the benefit of the ABS-CBN Lingkod Kapamilya Foundation. This event is Co-Presented by OLX.